OKLAHOMA CITY (AP) — The deadly tornado that plowed through an area near Oklahoma City last week was even larger and more powerful than previously estimated — a record 2.6 miles wide with winds that reached nearly 300 mph, just shy of the strongest winds ever measured. 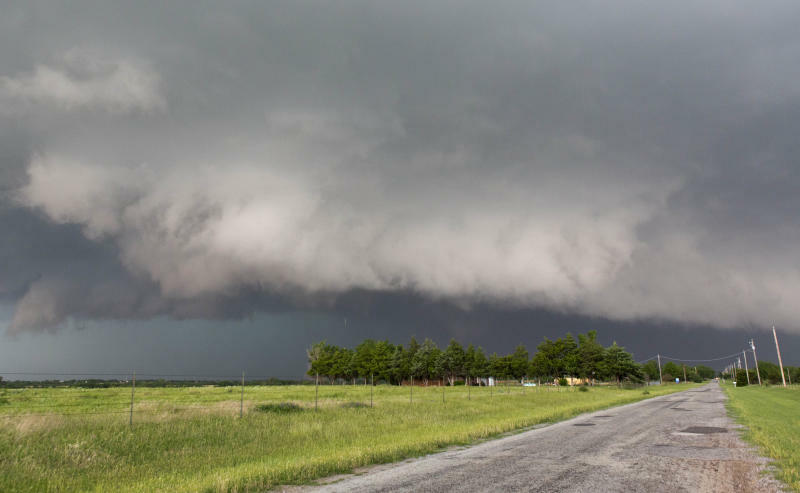 The National Weather Service on Tuesday announced that the twister that hit El Reno was a top-of-the-scale EF5 twister — the second to strike the area in less than two weeks. Friday's tornado was initially rated as an EF3. But the agency upgraded that ranking after surveying damage and concluding that the storm had winds of 295 mph. 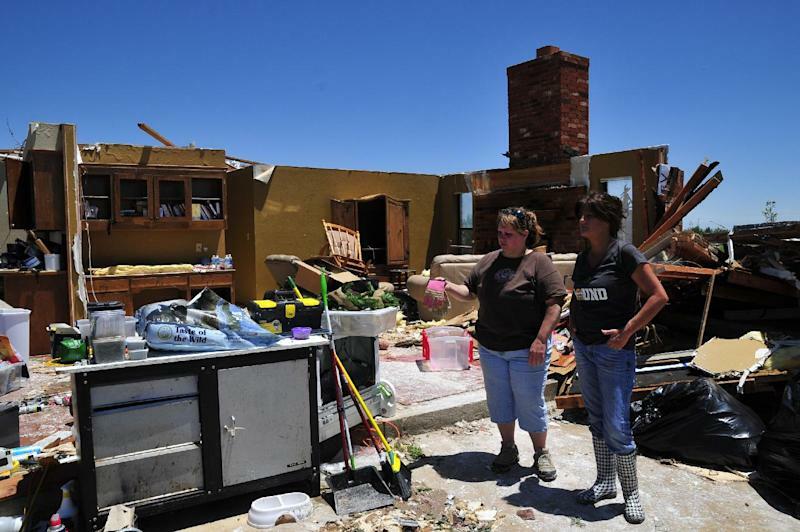 Nineteen people died in the storm and subsequent flooding, including three storm chasers. The Oklahoma City area also saw an EF5 tornado on May 20. That one raked Moore, a suburb 25 miles southeast of El Reno, and killed 24 people. Moore was hit in 1999 by another EF5, which had the strongest winds ever measured on earth: 302 mph. The massive tornado that formed Friday avoided highly populated metro areas, a fact that almost certainly saved lives. 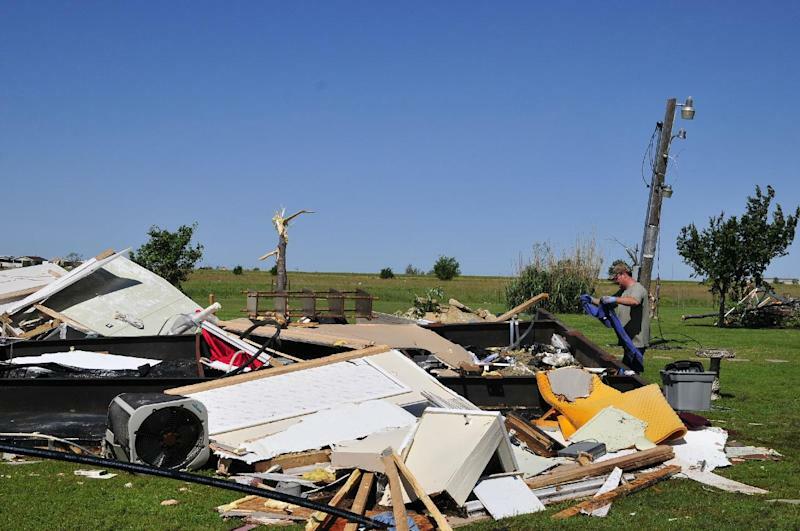 Winds were at their most powerful in areas devoid of structures, said Rick Smith, chief warning coordination meteorologist for the weather service's office in Norman. "Any house would have been completely swept clean on the foundation," Smith said. The twister marched through the countryside between El Reno and Union City, a region of largely rural farm and grazing land. Most of the destruction came toward the end of the tornado's 16.2-mile path along Interstate 40, where several motorists were killed when their vehicles were tossed around. Like many Midwestern cities, the Oklahoma City metropolitan area continues to expand in the suburbs, but the rapid growth hasn't quite reached as far west as where Friday's tornado tracked. William Hooke, a senior policy fellow of the American Meteorological Society, said the continued growth of cities in tornado-prone areas makes it only a matter of time before another monstrous twister hits a heavily populated area. "You dodged a bullet," Hooke said. "You lay that path over Oklahoma City, and you have devastation of biblical proportions. In El Reno, the city of 18,000 suffered significant damage, including to its vocational-technical center and a cattle stockyard that was reduced to a pile of twisted metal. But Mayor Matt White said it could have been worse had the twister passed to the north. "If it was two more miles this way, it would have wiped out all of downtown, almost every one of our subdivisions and almost all of our businesses," White said. "It would have taken out everything." The EF5 storm that hit Moore decimated neighborhoods. "It's very scary ... I don't think a normal person can fathom just how scary," White said. "I don't think they realize how lucky El Reno was." The storm's 2.6-mile-wide path surpassed a record set in 2004 in Hallam, Neb. And it would have made the storm hard to recognize up close, Smith said. "A 2 ½-mile wide tornado would not look like a tornado to a lot of people," Smith said, explaining that the twister would not have a tapered funnel and would instead resemble a dark cloud hanging below the horizon. Greg Carbin, a meteorologist for the National Oceanic and Atmospheric Administration's Storm Prediction Center in Norman, said May in Oklahoma is a time of weather transition, offering the perfect fuel for violent thunderstorms that can produce tornadoes — a combination of warm, moist air combined with cooler jet stream energy that causes massive instability in the atmosphere. "In these past two events, we've had a lot of unstable air sitting around, a lot of moisture and warm air," Carbin said. "That provides the fuel for thunderstorm development." Associated Press Writer Jill Bleed in Little Rock, Ark., contributed to this report.